Three teenage burglars have been sentenced today (Friday) after they were caught pretending to be asleep in bed when police officers caught up with them. Mark Boyce, 19, of Greenacres, Slapton Road, Little Billington at the time of the offence (but lately of Southwood Road in Dunstable), Patrick Casey, 19, of Aldbanks in Dunstable (but recently of no fixed abode), and Seth Lee, 19, of Wheatfield Close in Leighton Buzzard, were sentenced to a combined total of seven years and two months at Luton Crown Court. Additionally, a 16-year-old boy was also found guilty of the same offence and will be sentenced at a later date. Lee was sentenced to 40 months, Casey to 24 months and Boyce to 22 months imprisonment. Boyce received additional credit and a shorter sentence because he decided to return a watch stolen in the burglary and brought it to the court. In the early hours of June 15, police received reports from members of the public of a group of young people acting suspiciously in Waterdell, Leighton Buzzard. The officers attended and with the support of the National Police Air Support tracked the four teens to a house in Meadow Way. Officers gained access to the house and found Boyce, Casey, Lee and the 16-year-old undressed and pretending to be asleep in bed, alongside a large number of items of stolen jewellery. Although they were found sharing two beds, they denied knowing one another or having any involvement in the burglary. 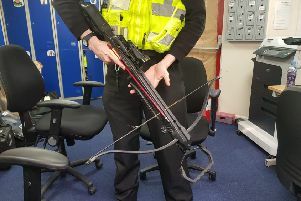 Detective Constable Andrew Boston, who investigated this case, said: “This was one of the more unusual cover stories for a group of burglars that I’ve encountered, but unfortunately for them our officers didn’t buy it. “The property recovered in the bedrooms where we found the offenders was identified as having been stolen from another house in the nearby neighbourhood. This allowed us to build a strong case against the offenders, who brazenly attempted to deny their involvement in this burglary.